The Frontiers of Flight Museum in Dallas, Texas is in Association with the Smithsonian Institute and features over 35,000 artifacts that tell the history of space flight and progress of aviation. Frontiers of Flight Museum was formed under the leadership of senator Kay Hutchinson and The University of Texas in 1988 when the collection of aviation artifacts donated by George Haddaway in 1963 outgrew its space at the University of Texas at Dallas. The nonprofit organization set up in the mezzanine level of Love Field with 5,500 square feet of exhibits that opened to the public in June of 1990. In 2004, A new 100,000 square foot museum on Dallas Love Field Airport was made possible through a $7.2 million grant and $2 million in private donations. The new museum opened to the public in June that year. Currently, military, commercial and general aviation artifacts are displayed in galleries with 30 aircraft total and more than a dozen themed exhibits that are dedicated to the history of space exploration and aviation. There is also an auditorium that seats 200, a discovery area for smaller children, and designated classroom and lecture space. There are 30 aircraft and space vehicles, 13 galleries, and 35,000 artifacts detailing the history of aviation and space exploration at Frontiers of Flight Museum. Early Flyers- Featuring the 1903 Wright Flyer full size model, this exhibit showcases early examples of flyers and the beginnings of modern aviation history. Lighter than Air- Artifacts recovered from the Hindenburg are showcased in this gallery that features giant dirigibles. The Golden Age- This gallery focuses on two decades of flight from 1919-1939 and highlights some of the most famous aviators in American history. 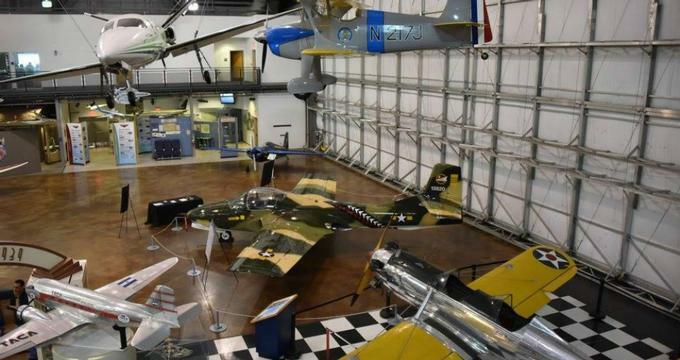 World War I, World War II, and the Cold War- These Galleries are dedicated to military artifacts and aircraft that tells the history of America’s involvement in conflict through aviation. Included in this exhibit are models of planes such as the Stearman PT-17 Kaydet Biplane and the British Vickers. Civil Air Transport and Air America- Most visitors do not know much about the military team that flew covert missions to southeast Asia at the end of world War II. This exhibit is dedicated to the personnel in these missions. Space Flight- Apollo VII space craft is seen in this exhibit alongside a moon rock which is unique in North Texas. There is also a replica of Sputnik I, a Soviet Union space craft and The Space Flight Gallery to be seen. The Heart of Our History- Local Airline, Southwest is showcased in this gallery that features a complete Boeing 737-300 that is open to the public. Love Field- Dallas Love Field features the history of Virgin America airlines and their arrival to the airport, as well as the 100-year history of aviation that has anchored the airport to Dallas and made it the world’s 10th busiest at one time. Research Library- Since the earliest days of forming, there has been a research library that represents a comprehensive history of aviation and space exploration. There are thousands of non-fiction texts collected in the Research Library that have been donated by the University of Texas, private donors, and authors. Researchers needing access to the library must make appointments. Model Shop- The model shop is organized by volunteers who meet to complete projects that vary from personal hobbies to group projects to support the museum. Anyone is welcome to come by and play in the model shop. Tours-Docent led tours are 1 hour long but do not cover all museum exhibits. Educators are encouraged to have their groups participate in self-guided tours using the tour handouts provided by the museum and explore exhibits at their own pace. Decent led tours focus on STEM and can have living history characters added on for an additional experience. Large groups up to 225 can be accommodated with additional details online. Exploration Space- This STEM program initiative immerses students in science and space exploration through interactive exhibits and programming, video series, web based learning, a portable planetarium experience, and learning stations. Living History- Volunteers for Frontiers of Flight Museum provide firsthand accounts of aviation history and portray adventure by some of the famous aviators in history including Ferdinand von Zeppelin, Amelia Earhart, Jimmy Doolittle, and Charles Rosendahl. These volunteers are also available to appear at parties, for field trips, and during events. Space Portal Odyssey Capsule- This portable planetarium seats 40 adults or 60 children and is a 6-meter dome that allows space exploration from anywhere using nightshade simulation and special software and fish eye lenses for 360 degrees viewing.